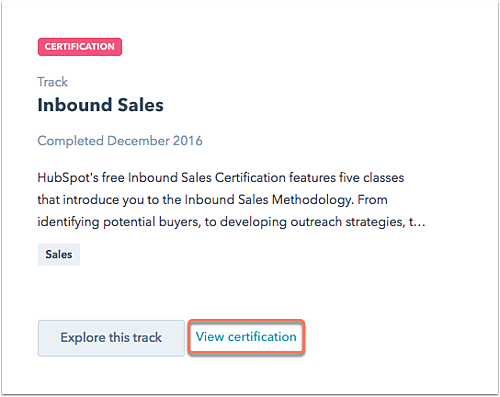 When you've completed one of HubSpot's certifications, you can view your certification, download a printable copy, embed the certification badge onto your website, or add it to LinkedIn or Upwork. Please note: it's not currently possible to get a high-resolution version of your certification badge. The badge you receive after passing any certification exam is the only one available to use. Search for the certification you want to review, and click View certification. At the top of the pop-up window, you'll see your score for the certification. Click one of the social sharing icons to share the news that you've passed your certification with your friends and followers. Click socialBlockLinkedin Add to my profile to add your certification badge to your LinkedIn profile. Click Download a printable certificate to access and print a PDF of your certification. Click Copy code to copy the embed code to the right, which you can then embed on your website. Click Add to Upwork to add your certification to your Upwork profile.